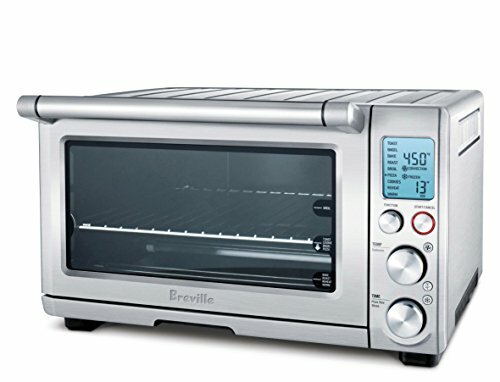 The Breville BOV800XL Smart Oven is a must-have for small kitchen. In most cases it can serve as a replacement for it larger cousin the conventional oven/range. However, the Smart Oven is much more energy efficient and can fit into the smallest of kitchens. It is carefully constructed from the most durable materials. It is attractively housed in reinforced stainless steel, a striking addition to any kitchen. The roomy interior is coated with a non-stick material that can safely withstand high temperatures, making cleanup easier. 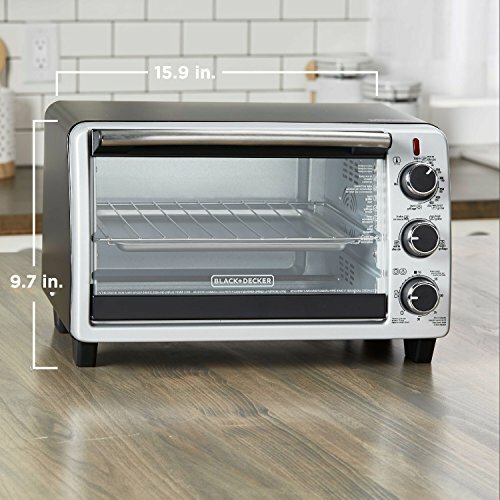 Breville has been making world-class small kitchen appliances for years and years now, and this toaster oven is a perfect representation of exactly what they bring to the table. One of the larger size units on the market right now, it measures 18.5 x 16.25 x 11.25” – giving you ample space inside of the cooking area while at the same time maintaining a relatively compact footprint to free up as much of your counter space as possible. Combine that with an 1800 W convection oven with a completely nonstick cooking surface and interior – as well as their patented Element IQ cooking technology that allows amazing customization and versatility with the heating solution – and you have a truly world class product on your hands. A crumb/drip tray that is accessible from the front of the oven also makes it easier to clean between cooking sessions. In addition, the oven includes a patented magnetic auto-eject rack: small magnets embedded on the sides of the oven door pull the wire rack halfway from the oven when the door is opened, making food easier to remove and preventing burns. Baking utilizes another feature of the Smart Oven that contributes to even heating: convection heating. Convection cooking uses a fan to circulate hot air so all sides of the food cook at the same rate. This is particularly important for baked goods, such as cookies and cakes, which need to be cooked evenly all the way through. Door seals nicely – reducing energy waste and the unneeded heating of your home. 9 programmable settings – HOWEVER – you also have the ability to tailor the settings to your individual needs. Nice Stainless steel finish will look nice in all kitchens. Despite being stainless steel the surface of the oven does not show too many fingerprints. 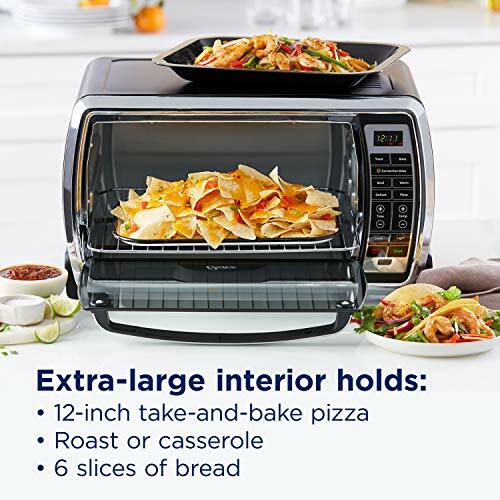 Not just a standard toaster oven – this is also a convection oven! The Breville BOV800XL is so vastly superior in every way – function, capacity, ease of use, and ease of cleaning. The Oster TSSTTVMNDG-SHP-2 Digital Large Capacity Toaster Oven convection bake works very well and really speeds up cooking. It very attractive in looks and is easy to clean. The price is reasonable and its a good size. You can use it for bagels, toast, pizza, egg rolls and much more!! Oster makes a really nice oven with all the convenient options that make using it simple. The oven and toaster temps are true, and this is one oven that has an interior light. I like that it lights up when the oven or toaster function begins. You can manually turn off the light, but I like to see what’s cooking in there. Many brands don’t even HAVE an interior light. The size is perfect for a corner of counter area, and this oven is attractively designed. I recommend this for its ease of use and many functions. Also works well for re-heating. It works perfectly for roasting and toast, and defrosted muffins to a state of freshness. Compared to other ovens, the touch-pad “buttons” are few in number but self-explanatory and comprehensive. With unilingual labels, the font choice was allowed to be large enough for legibility. A perfect, and lucky choice. Buy this , you won’t be disappointed! This model is exactly the same as the previous model, except it comes in a black and chrome design. The Cuisinart TOB-260 convection toaster oven offers exactly the same features as mentioned above, but has an extremely sleek appearance in this color scheme and is slightly larger to accommodate six slices. Other Cuisinart TOB toaster ovens include the TOB-30BW, TOB-100 Classic, TOB-195, BRK-300 and TOB-60. Check them out for even more options to find the perfect one for your cooking needs! Picking a Cuisinart toaster oven is rather simple if you know what you will be using it for most of the time. 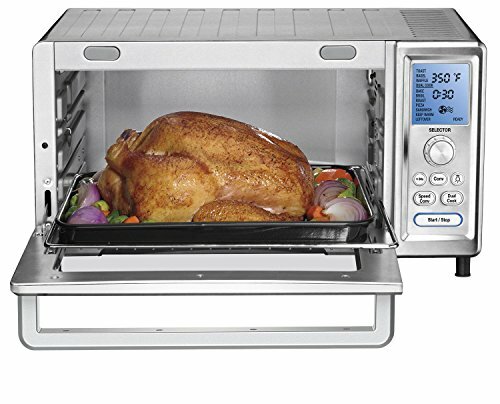 The convection oven feature really is worth the extra money if you will be doing much more than basic toasting or heating up in your oven. This model is around the same price as the previous oven, and has the same capacity. It has the same dial turn operation as well and comes with three different settings: bake, broil, and toast. This one can also be set to stay on until you manually turn it off and has a fifteen minute timer which will shut the oven off automatically. The crumb tray easily comes out for easy clean up. The Hamilton Beach 31333 is still a rather basic oven, but has a couple extra features from the previous model. This is a space saving design which will not take up much room on the counter, while still holding up to 4 slices of bread. It has a very basic black design with traditional turn style knobs for settings. It is capable of basic broiling, baking, and toasting functions. One rack can be placed on two different levels and it is equipped with a 30 minute timer.The oven has 1200 watts of power and is suitable for very light or occasional use.